David has spent over two decades at PSA Group. PARIS -- PSA Group's DS upscale brand appointed Marion David as product director, succeeding Eric Apode, who had held the post since 2014, when the brand was spun off from Citroen. David, 46, has worked at PSA since 1996, starting as a market research analyst. She then worked in product strategy and development at Peugeot from 2002 until 2016, including leading product development for the Peugeot 3008 and 5008 crossovers starting in 2012. 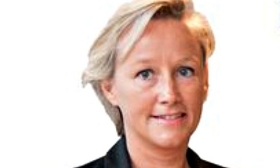 Since 2016 she has been the head of Peugeot and DS dealerships at PSA retail. Apode will take up a management position at PSA Group’s India-Pacific region. He is a veteran of the automaker’s Asian operations, starting in 2007 as a director of PSA’s joint venture with Dongfeng Motor. From 2010 until 2013 he was CEO of PSA’s other joint venture in China, with Chang’an Automobile Company. DS has started a comprehensive overhaul of its range, with models designed from the ground up for the brand, starting with the DS 7 Crossback SUV. The DS 3 Crossback was introduced at the Paris auto show last month. The brand will introduce a new model each year for the next four years. DS sales had fallen sharply since 2014, but the introduction of the DS 7 has given the brand a boost this year. Global sales were up 3.4 percent through September, to 40,400.